With CESAR® HOME DELIGHTSTM, we borrowed the recipes families love most and made them just for your dog. With irresistible combinations, there's a variety of dishes you're sure to recognize and they're sure to love. 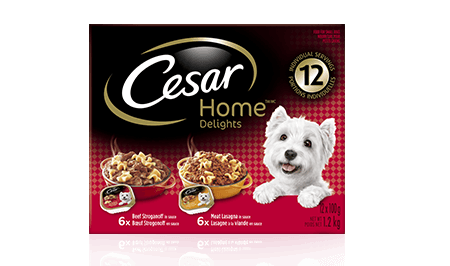 CESAR® HOME DELIGHTSTM Meat Lasagna in Sauce is formulated to meet the Nutritional levels established by the AAFCO Dog Food Nutrient Profiles for maintenance. CESAR® HOME DELIGHTSTM Beef Stroganoff in Sauce is formulated to meet the Nutritional levels established by the AAFCO Dog Food Nutrient Profiles for maintenance. Meat Lasagna: CHICKEN, BEEF, LIVER, PASTA, MEAT BY-PRODUCT, STARCH, WHEAT GLUTEN, MINERALS, PEA FIBRE, SALT, WHEAT FLOUR, SODIUM TRIPOLYPHOSPHATE, TOMATO POWDER, BASIL LEAF, VITAMINS, CHEESE, COLOUR, OREGANO POWDER, NATURAL FLAVOUR, XANTHAN GUM, GUAR GUM, SUFFICIENT WATER FOR PROCESSING. Beef Stroganoff: CHICKEN, BEEF, LIVER, PASTA, MEAT BY-PRODUCT, CHEESE, STARCH, WHEAT GLUTEN, MINERALS, PEA FIBRE, SALT, WHEAT FLOUR, SODIUM TRIPOLYPHOSPHATE, VITAMINS, COLOUR, NATURAL FLAVOUR, XANTHAN GUM, GUAR GUM, SUFFICIENT WATER FOR PROCESSING.